A vigil will be held outside the Town Hall on Tuesday evening. Outraged residents in Woodlands, Hillside, Rokeby and Dunchurch have joined forces to oppose Rugby Borough Council’s new Local Plan. 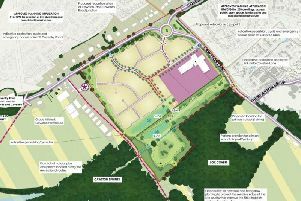 Last week the council published its draft plan, which proposes a swathe of new housing on the green fields between Cawston and Dunchurch and a new “village” of 1,500 houses off the A45 near Grandborough and Willoughby. In light of this, residents from neighbouring parts of Rugby have come together to form a new group with the temporary name About Turn, to share knowledge and skills in fighting the plans. The group say they feel particularly concerned that a fresh round of consultation is taking place before the results of the first consultation (which took place in the winter) have been published. And they will hold a vigil outside Rugby Town Hall at 6.30pm on Tuesday, as councillors come together to vote on the Local Plan. Richard Allanach, one of the group members, said: “At the moment the council has a half-baked plan which lacks even a map showing what they propose. “The council has not published the results of last winter’s consultation and yet it is rushing to rubber stamp a new plan. The council should pause, take breath and reconsider before sending in the bulldozers”. Hillside resident Sara Herrington added: “I would urge people to get involved and consider the plan as there is a lot happening in Rugby at the moment. Rugby Borough Council is hoping to send its draft plan to the government in December and have it adopted next year.